Why stay home for the holidays? Especially when so many luxury family resorts go above and beyond to create an enchanted holiday celebration for their guests! I’ve researched the top family resorts with the most unique, lavish and fun family offerings for the 2018 holiday season so that you don’t have to. Each of these luxury family resorts offers a one-of-a-kind holiday experience with a little something for everyone. Check out these outstanding luxury family resorts. Each goes above and beyond to make sure guests have an unforgettable holiday stay. Five-star amenities under a starry sky—and then, of course, there’s that twinkling star on top of the tree. That’s Christmastime in Montana. 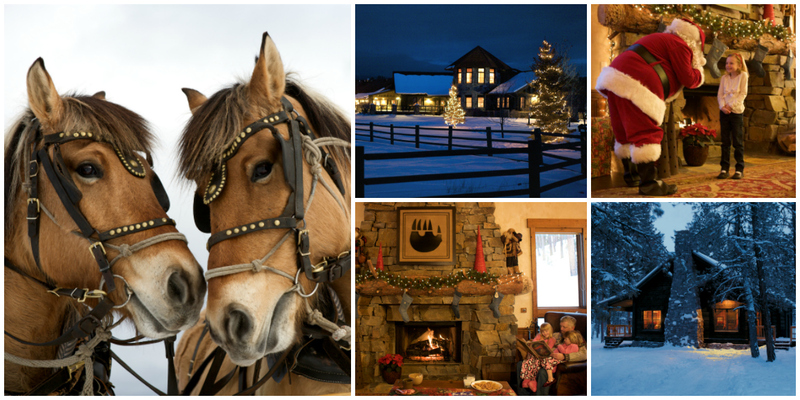 The Resort at Paws Up will make your holiday dreams come true. Enjoy real-life sleigh rides, gingerbread house building, game nights, dogsledding, bonfires, even a Christmas Eve kid’s party—all set against a background of snow-covered mountains. Each guest has their own tree, in their own private home, and everyone gets a personal visit from Santa—complete with an exclusive Paws Up Christmas stocking. The whole family will fall in love with the Paws Up experience! Naughty or nice—everyone is treated to fantastic holiday meals artfully prepared by acclaimed Executive Chef Sunny Jin. Join the fun at their amazing restaurants or they’ll happily deliver your meals to your luxury home. Treat yourself to some chill time at the spa, or browse for unique gifts at the Wilderness Outpost. After one amazing night, you’ll know why the holidays at The Resort at Paws Up are truly magical. Ring in the holidays building sand castles and playing by the pool with the family. Check into the ultra luxe Acqualina Resort & Spa on the Beach. Kids will love the special holiday activities. Some of this year’s holiday kids activities include crafting ornaments, face painting, balloon twisting, glitter tattoos, caricatures, and gingerbread houses. Families will love exploring nature with the sea turtle interaction activity. On Christmas Eve and Christmas Day, foodie families will love holiday brunch at AQ Chop House by Il Mulino. And on New Years Eve, the entire family can choose from two festive parties on site. Ring in the New Year at Il Mulino New York, savoring Chef Michael Mazza’s specially curated four-course dinner menu with premium open bar and live music. And AQ Chop House by Il Mulino is also hosting a New Year’s Eve dinner with live music, a DJ and spectacular ocean views. Enjoy a premium open bar and the most exquisite buffet, featuring lobster, caviar, oysters, snow crabs, and much more. 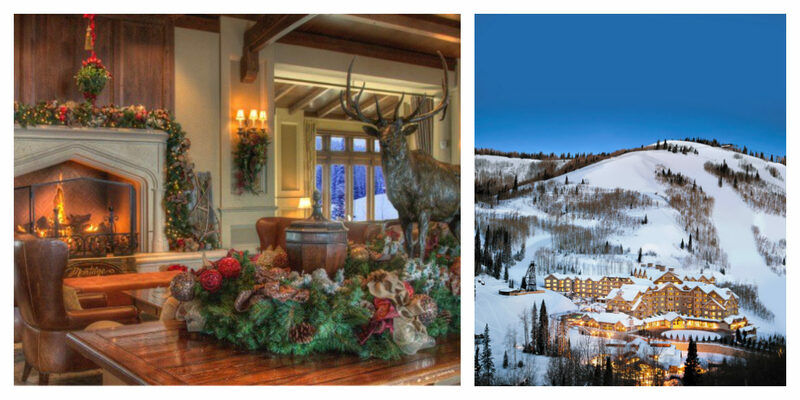 This holiday season, sink into the snow-filled festivities at Montage Deer Valley. Beginning December 2nd-10th, the resort kicks off the holidays with a traditional menorah lighting ceremony for each night of Hanukkah. A jam-packed December schedule of family-fun events culminates in Christmas dinners perfect for the whole family or for a cozy romantic evening. Indulge in post-ski festivities at the resort’s luxurious Veuve Clicquot après ski lounge. Ring in the New Year at one of several New Year’s Eve celebrations from the family-friendly dinner in Apex to an upscale sushi dinner or the black tie soiree and kids’ paintbox New Year’s Eve celebration, there’s sure to be something for each guest! 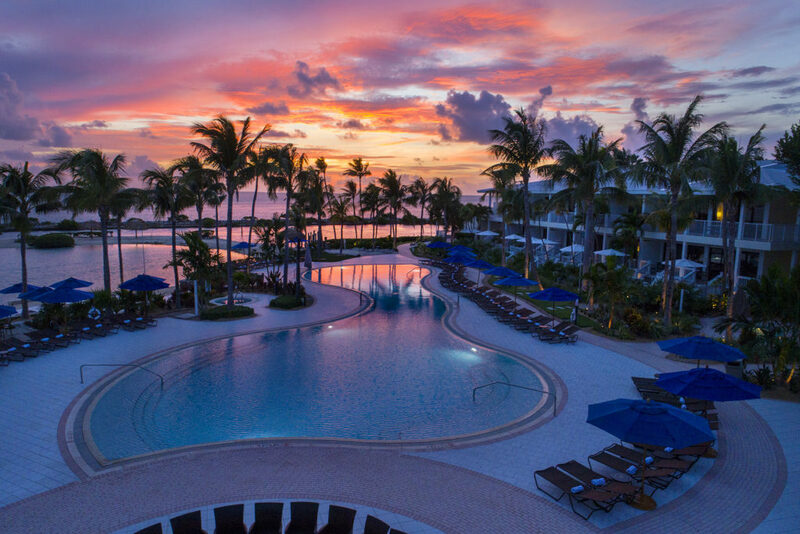 Families looking to start a new holiday tradition in the warmth of the Florida Keys can sunbathe alongside Santa and his elves, create gingerbread houses and design Christmas cards during Hawks Cay’s 25 days of Christmas. Santa, Mrs. Claus and the elves make Hawks Cay Resort their home for the 25 days leading up to Christmas to entertain families with unique activities. The Christmas package includes: Elf Tuck-Ins, Story time and hot chocolate with Mrs. Clause, Santa’s workshop, gingerbread houses, carolers, and letters to Santa. Families will also enjoy the Christmas “Spirit” Card which includes complimentary Christmas cocktails at Angler and Ale, Sixty-One Prime Bar and Tiki Grill Bar. Everybody loves Walt Disney World at the Holidays. Spend more time making memories at the Disney Parks by enjoying the Extra Magic Hours benefit, available to guests with valid theme park admission, through December 31, 2019. The Extra Magic Hours benefit means that each day Four Seasons Resort Orlando guests can enjoy select attractions as one of the four Walt Disney World Theme Parks opens early or extends later, and during select dates, the Extra Magic Hours benefit may also be offered at a Disney Water Park. It’s so wonderful to get out of the crowds in the park and come home to a luxury family resorts stay at Fours Seasons Resort Orlando. From the royal palm-lined pathway lined with twinkling lights, to the holiday inspired floral arrangements and incredible Penguins Holiday Party chocolate display in the lobby, Four Seasons glows with festive spirit that is sure to delight anyone who walks through the door. Families love a stay in the park view rooms. Each offer prime viewing of the nightly fireworks from a spacious furnished terrace. A stay in the Resort’s top suites, including the Royal, Presidential and Grand suites, makes celebrating the holidays even more special. For guests of the Royal and Presidential suites, eight hours of butler service per day is included on the day of arrival and the day of departure. After a day in the parks or playing in the resort pools, holiday treats are always a hit. From peppermint s’mores at PB&G to holiday gelato flavors of chocolate cinnamon, gingerbread, and crushed candy cane at Lickety Split, the holidays are the perfect time to indulge. Lickety Split will also offer an array of holiday treats, such as pistachio and cranberry bark, pecan toffee, mini mint chocolate cookies and more to satisfy a sweet tooth. The whole family will enjoy complimentary cookie decorating with Chef Rabii, offered to Resort guests on select dates. The Kids For All Seasons (KFAS) complimentary kids camp has an array of organized activities planned for Resort guests throughout the festive season. From candy cane scavenger hunts to animal visits, snowflake water games, make-your-own reindeer food, snowman sack races, pin the heart on the Grinch, face painting, and much more, the KFAS team has a thoughtfully orchestrated schedule to provide fun for all ages. Kids will love the poolside viewings of holiday movie classics such as The Polar Express and A Christmas Carol plus making gingerbread houses and writing letters to Santa! 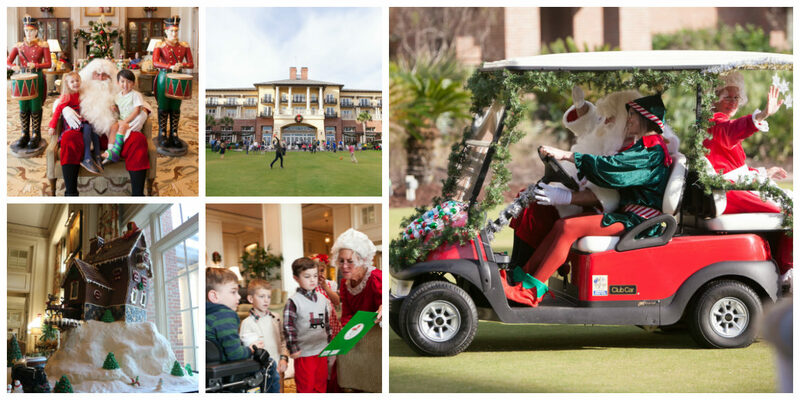 There’s no reason to be a Grinch this holiday season, especially if you are lucky enough to be a guest of the Kiawah Island Golf Resort. The holidays at Kiawah Island Golf Resort begin when the staff at the Forbes Five Star-rated Sanctuary Hotel deck the halls for the holiday season. The official tree-lighting ceremony begins with great pomp and circumstance followed by sing-along Christmas caroling. Kids of all ages pack the hotel’s Morning Room to decorate holiday cookies each Saturday through the weekend before Christmas. Perhaps the most highly anticipated holiday event is the grand arrival of Mr. and Mrs. Klaus — via golf cart, naturally. After appearing on the Grand Lawn, the Klauses head indoors to the lobby where children of all ages have the chance to visit with Santa as parents get a photo for their holiday cards. After visiting with Santa, Mrs. Claus reads Christmas stories beside the Morning Room fireplace. Later, the Sanctuary Pastry Team unveils the astonishing annual gingerbread house creation this year features a Grinch-inspired vignette. The festive season doesn’t end with Christmas as the celebration continues for a week culminating on New Year’s Day. New Year’s is truly a family occasion with numerous celebrations and parties specially geared for guests of all ages. At Night Heron Park, guests of all ages enjoy a bonfire and s’mores, and the family New Year’s Celebration culminates with a thrilling fireworks display. Back at the Sanctuary, Kamp Kiawah throws an age appropriate party for young kids, while the Teen’s New Year’s Bash includes music, video games, snacks and crafts. On New Year’s Day, after a special brunch at Jasmine Porch, guests can work off the excesses of the night before with a 5K fun run on the beach and Polar Bear Plunge in the Atlantic. Gather your ohana and travel to Hawaii Island for a stay at Four Seasons Resort Hualalai. Partake in festive seasonal activities with the spirit of aloha by unwinding at the beach, snorkeling with thousands of tropical fish in King’s Pond, or playing with the kids by the pools and breathing in the fresh island air. 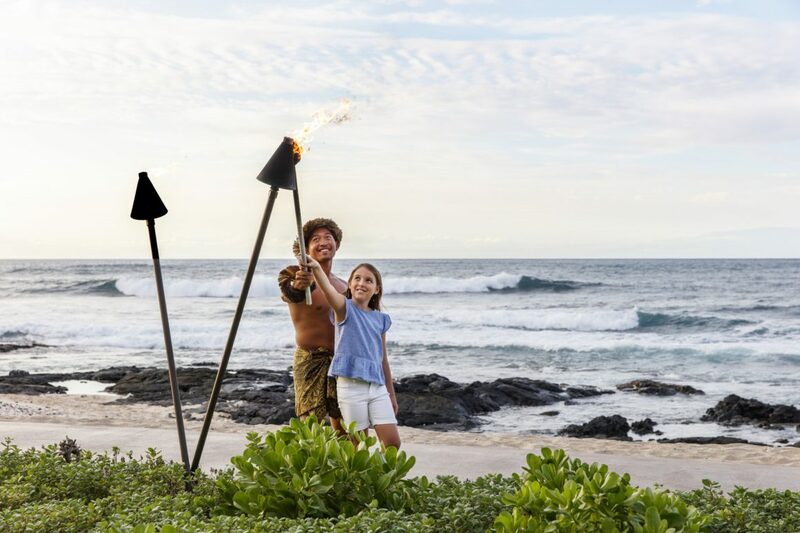 Four Seasons Resort Hualalai has a full itinerary of daily activities for all ages. And they offer special holiday events such as a fabulous luau and Polynesian show, complimentary s’mores and stargazing. Guests staying the week of Christmas can reserve a spot at the Kumukea Beach Cook-Out for a fun toes in the sand night with Chef’s stations, house-made cocktails and paired wines at the beautiful Kumukea Beach. Families will love exploring the Trading Company Hawaiian style block party with food trucks and stations serving up delightfully savory dishes. Artisan booths and entertainment complete the fun, casual scene. Holiday dining is all part of the amazing experience with an incredible family Christmas feast at Ulu Ocean Grill. And there’s no better way to ring in 2019 than at the Moulin Rouge themed New Year’s Eve gala under the stars complete with fireworks. This holiday winter season, The Ritz-Carlton, Lake Tahoe, is the top destination for the ultimate relaxed California luxury family experience. 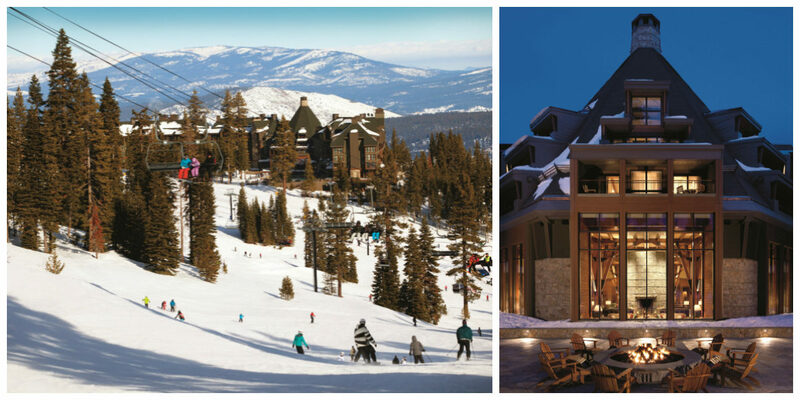 As the only ski-in/ski-out destination in Lake Tahoe, families will indulge in unparalleled luxury with world-class ski valet services, award-winning dining and culinary offerings, lavish seasonal spa treatments, and the finest hospitality all around. From the moment of arrival, The Ritz-Carlton, Lake Tahoe provides a seamless experience for the perfect luxury family ski vacation. When not on the slopes, The Ritz-Carlton, Lake Tahoe offers an array of festive family-friendly activities and programs around the resort. Some favorite activities include the new Very Important Kid (VIK) program, the nightly Marshmology s’mores roasting experience, special appearances from Santa and Mrs. Claus, a life-sized gingerbread ski gondola and a dozen festively-decorated holiday trees on display, and much more. On December 21 and December 28, families can partake in Stars & S’mores with Tahoe Star Tours for an engaging fireside astronomy session that includes a science-based conversation about the cosmos, poetry reading, and telescopic viewing, followed by s’mores around the resort’s outdoor fire pit. To bring in the holiday cheer while away from home, the resort offers an in-room holiday trees package to be purchased and set up by staff in guestrooms, suites and residences this season. Artificial trees decorated with strung lights and bulbs are available in a range of sizes varying from 4’ to 6’ and are offered. A luxury winter experience is never complete without fabulous dining options. 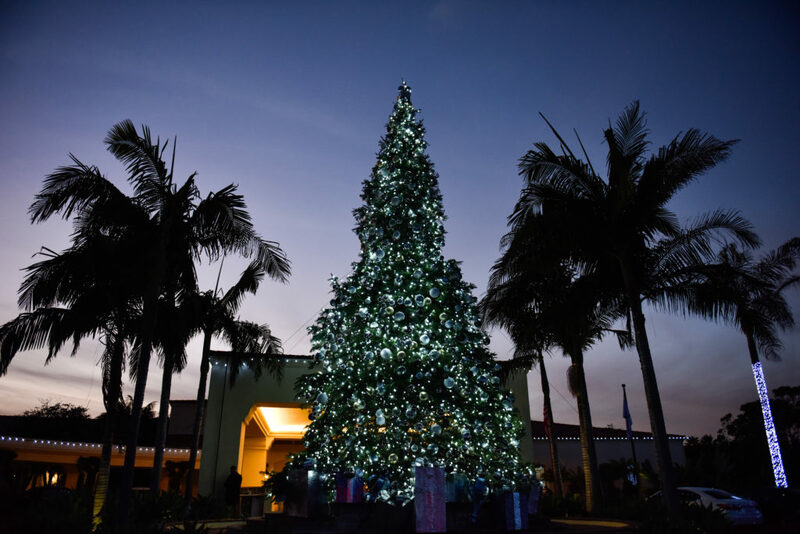 To celebrate the holidays, the resort will offer a festive Holiday Dinner and Holiday Buffet on Christmas, as well as a New Year’s Eve Dinner and New Year’s Day Brunch. 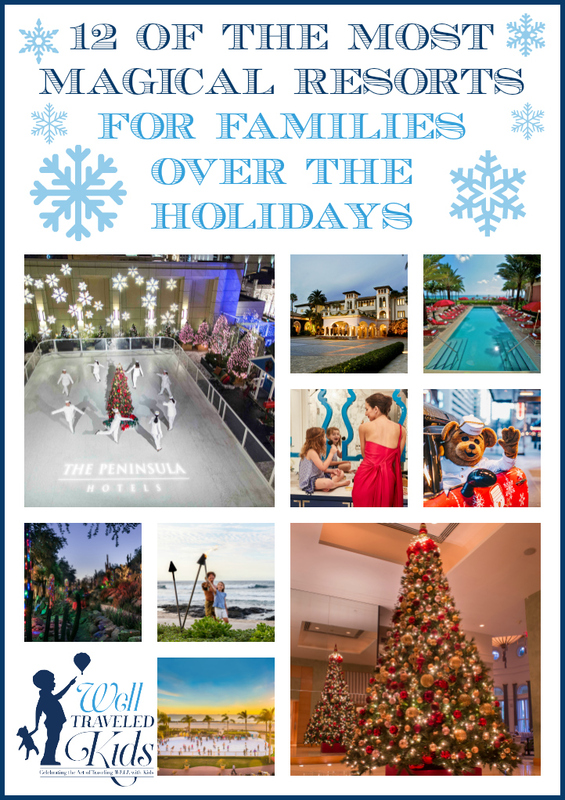 The Peninsula is dedicated to creating lasting memories—holidays are special opportunities to provide the setting for magical moments for families. 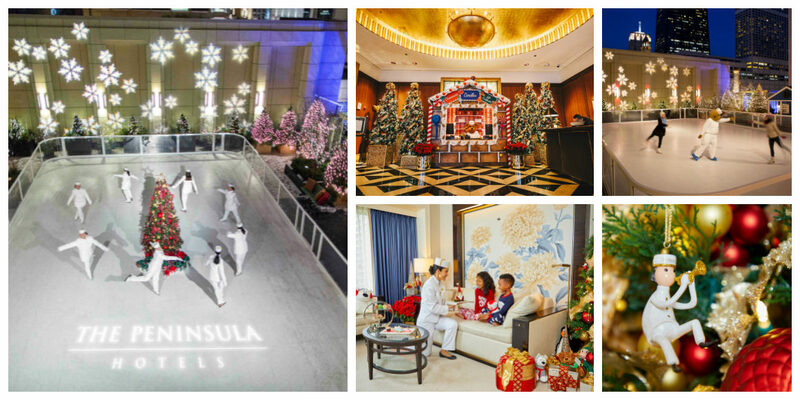 The holidays are nothing short of spectacular at The Peninsula Chicago, with delicious cuisine, festive décor, joyful celebrations, a visit from Santa and Peter Bear, and The Peninsula Sky Rink’s seasonal return—all providing the perfect backdrop for this festive season. Take the family ice skating at The Peninsula Sky Rink perched above Chicago’s bustling Michigan Avenue surrounded by the city’s skyscrapers and twinkling lights. Enjoy the spirit of the season with the holiday afternoon tea at The Lobby amid live music around The Peninsula’s joyous Christmas tree. Indulge in special delicacies, including house-made scones, finger sandwiches and pastries. Industry, Complimentary skating and a round of drinks for two at The Sky Rink, Chocolate Bar for four, and in-room Christmas movie library! of spectacular. A children’s station with child-friendly delicacies will be available along with the decadent spread for adults. Entertainment includes a live string quartet, a children’s lounge and a magician for young patrons, and, of course, a visit from Santa Claus under The Lobby’s magnificent tree. Guests can begin their New Year’s resolutions after savoring the extravagant New Year’s Day brunch in The Lobby, kicking off the New Year to the sounds of a string quartet with an indulgent feast of festive foods. 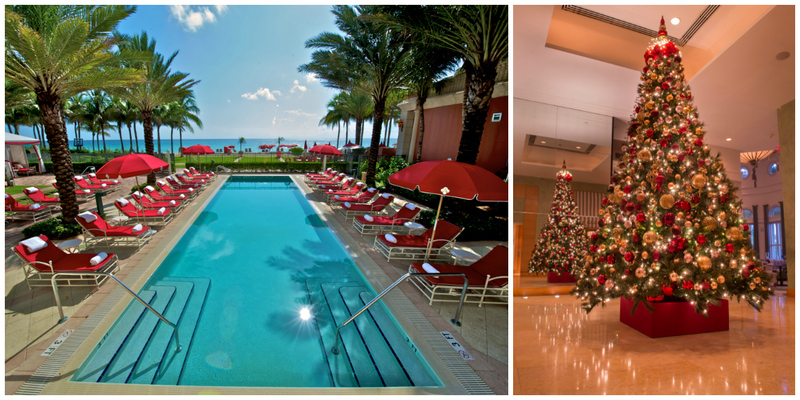 Press pause this holiday season with a family getaway to Eau Palm Beach Resort. Go for a swim with Santa, and be sure to take the whole family out for the Tired Elf Scavenger Hunt. Relax back in your exclusive club-level accommodations. Sign the kids up for special kids club programs (such as an ugly holiday sweater making party) while you relax, sip champagne and nibble on cupcakes at the Forbes Five Star Eau Spa. Stay for New Year’s Eve and Toast Around the World with a glass of bubbly each hour till midnight oceanside at Breeze Ocean Kitchen. Kids will love partying the night away at AquaNuts New Years Eve Party. First Ski all day! 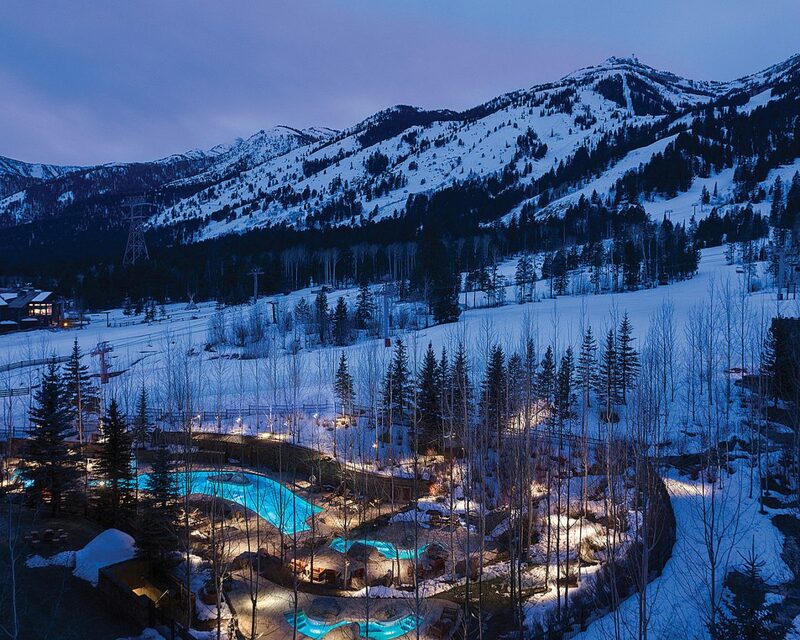 Then head home to Four Seasons Jackson Hole for festive activities the whole family will love. The Resort’s dog Tillie will be welcoming guests this winter with her very own cartoon book. Local artist Greta Gretzinger partnered with the Resort to bring Tillie of the Tetons to life. The cartoon books will be available upon check in. The Resort has also partnered with Teton County Library to feature weekly story time, where young guests, together with their parents, are welcome to cuddle up alongside Tillie and enjoy some literary adventure. This winter, guests will have a unique chance to capture the beauty of the Milky Way with the Resort’s astronomy and astrophotography partner Teton Skies. During the Night Sky Photography Experience, guests will be transported to a special dark sky location within Grand Teton National Park, where the Resort’s dedicated team of professional astronomers and photographers will lead them on an exploration of the cosmos and provide instruction on the best tools and techniques for capturing the Milky Way in all its glory. The experience includes guided use of our large diameter telescopes, catered refreshments, cosy blankets and heaters, and the use of iPads loaded with special stargazing software. The signature hot chocolate at Ascent Lounge is not to be missed. Indulge on the house made cocoa while sweet peppermint marshmallows melt in to the creamy mix. Know for her ability to wow, Chef Rhonda Ashton did not miss a trick with this wintery must-have delight. To top it off the hot chocolate will be served in a custom designed mug by local artist Katy Ann Fox. For guests looking to make their own creation, they are invited to join weekly mixology classes available in the lounge with lead mixologist Adam Reed. Guests will receive a 30 minute tutorial on how to make the perfect wintery cocktail from hot toddy to mulled wine. Experience the magic of the holidays when America’s beachfront legend transforms into a whimsical winter wonderland. 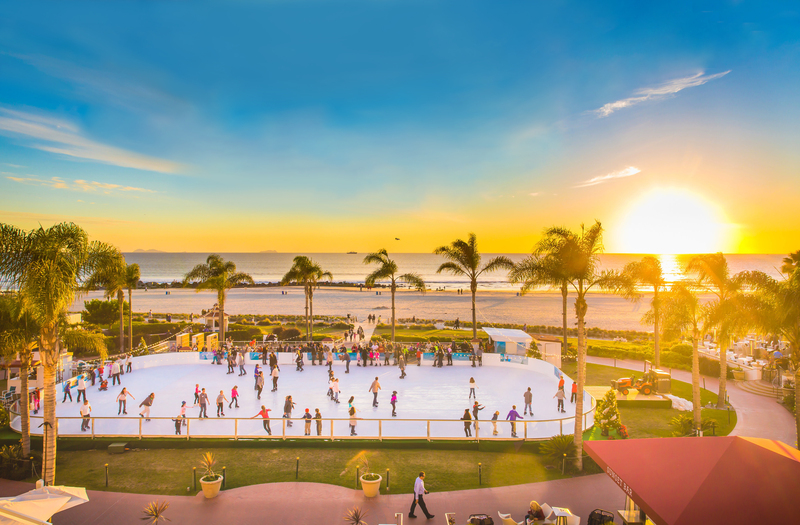 Families staying at The Del will love ice skating by the sea on the beach front ice rink, brunching with Santa, and gathering at sunset in Santa hats to roast holiday s’mores with your toes in the sand for the Jingle Roast. Kids and teens can ring in the New Year in style at The Del. The party includes dinner, ice skating, special shows, games, s’mores roast, and a midnight toast with sparkling cider. Teens ages 13-17 can also hang out in their own lounge and watch movies. Hotel del Coronado’s magnificent Crown Room will turn into ‘Club Crown’ to ring in 2018. Adult party guests will enjoy dancing to music from DJ Hevrock, dessert, midnight champagne toast and a cash bar. Maybe the most festive of the luxury family resorts can be found in Georgia? From elf tuck-ins and live carolers to Santa sightings, there are many reasons to head to Sea Island Resort this Christmas holiday. First, join the Reindog Parade for the family pups dressed up in their Christmas best. Next, compete in the Sea Island famed Bingo. Then get busy building gingerbread houses. Next take the family on a pheasant shoot. Then dress in your holiday best for a culinary trip to Italy during the “Feast of Seven Fishes” dinner in The Cloister Wine Cellar. On Christmas Eve, grab your antlers and sleigh bells for the Reindeer Dash Family Fun Run. Most importanly the annual Children’s Christmas Party begins at 10 a.m., where the biggest wonder of the day will be Santa’s gift. Gather as a family for the Christmas Eve Buffet in Mizner Ballroom. Then attend the annual Yule log ceremony later that evening. On Christmas day, special brunches and dinners are on tap, along with a white Christmas at the Snow Day at Retreat. The Ritz-Carlton, Laguna Niguel invites guests to experience the surprise and delight of the holiday season. The resort transforms into a holiday wonderland with sparkling lights, sweet treats and special events. The most noteworthy holiday family events include a Gingerbread decorating class and a stand-up paddle boarding and surfing competition. Men, women and children dress as holiday-inspired characters and surf or stand-up paddle board to benefit Surfers Healing. Afterwards, a holiday surfboard auction with dozens of surfboards also will be on display throughout the resort lobby for bidding. Other fun family activities include a holiday tea, gingerbread extravaganza, holiday storytelling, and a bountiful Christmas buffet of homemade favorites. guests and locals celebrating in the Cape. The offerings planned by the resort’s world-class activities and culinary team will be sure to delight. Some of the most popular activities include a Teddy Bear Tea Party, Christmas story reading, Christmas carolers, gingerbread workshop, Santa’s workshop, and cooking classes. 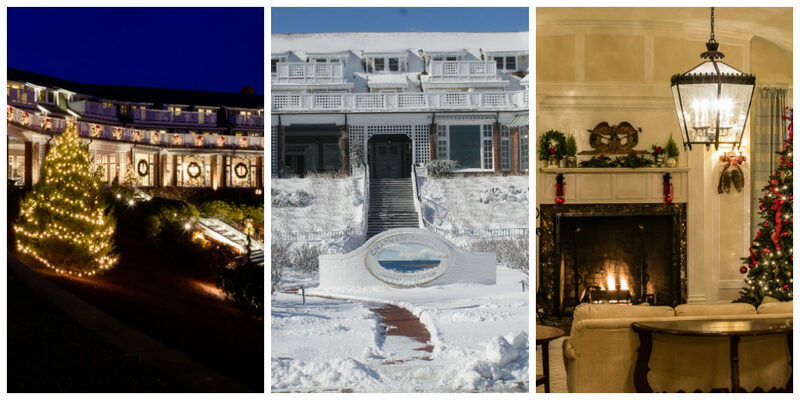 Chatham Bars Inn is the perfect place for a delicious and cozy holiday celebration. The gorgeous and charming resort welcomes all gather at the table for a holiday meal. Culinary offerings include: Christmas Grand Buffet at STARS, Christmas Menu at Sacred Cod, New Year’s Eve Dinner at STARS, and a New Year’s Eve Party at Monomoy..
S’mores and desert stargazing, and lighted Cactus Garden tours, are just two of the many signature activities to expect. Enjoy breakfast with Santa, and then visit his workshop, where you can create special crafts – and treats. Participate in the lighting of the Menorah, and partake in some Sufganiyot (donuts with red jelly filling). And don’t miss out on the flying trapeze. 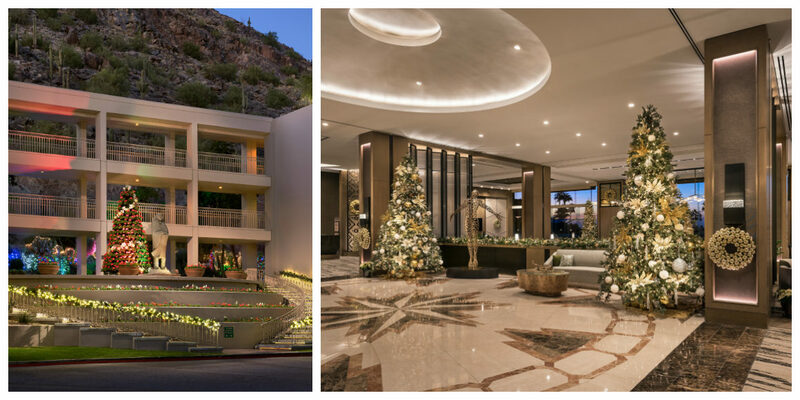 These are just a few of the dozens of holiday activities available to guests at the freshly redesigned Phoenician Resort in Scottsdale. 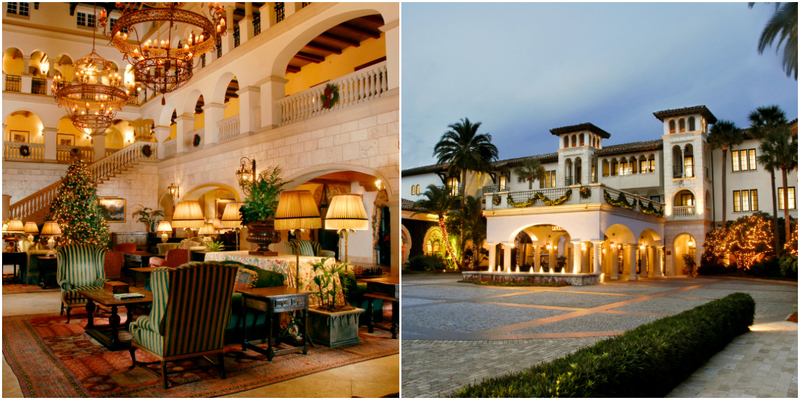 Monarch Beach Resort is the perfect destination for a holiday getaway. Join the Monarch Beach Resort Pastry Team in the sweet tradition of decorating gourmet gingerbread houses. Be on the lookout for Santa who will stop by during every academy session. Families take their photos with Santa and leave with having made an incredible custom gingerbread creation. Guests during the holiday season will enjoy festive teas, Hanukkah Menorah candle lighting, and out-of-this- world culinary activities. 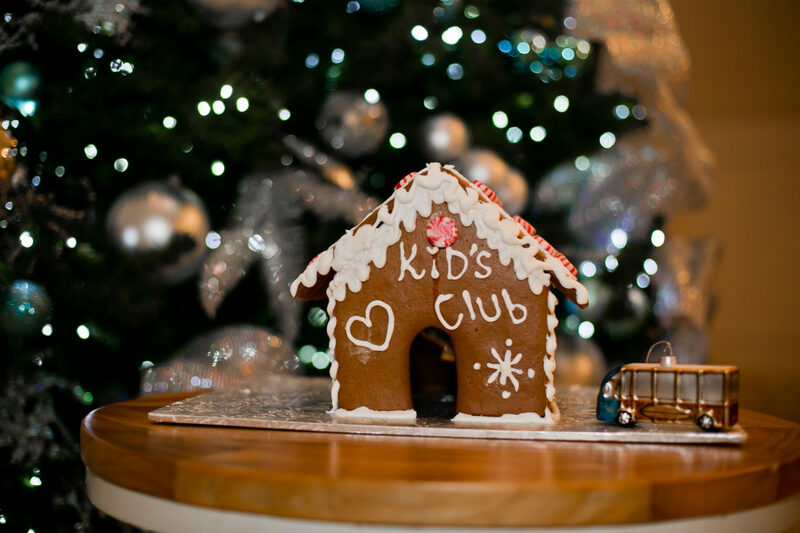 Kid will love heading to the kids club for holiday fun including scavenger hunts, creating winter canvas prints, making beaded snowflakes, and sea glass necklaces. This holiday season, take your kids for Christmas in Palm Desert California at the JW Marriott Desert Springs Resort & Spa. The Desert Springs culinary team Gingereers decorate the Main Lobby with a giant LEGO building blocks gingerbread house. Drawing inspiration from the celebrated childhood brand LEGO- and lending a playful nod to the building blocks of the 450-acre resort’s current renovations – the gingerbread house features a second level balcony and is comprised of nearly 200 pounds of sugar, 400 pounds of icing, and 800 multicolored cookie bricks. Adorning the house are 1,400 lego lollipops, 100 pounds of LEGO hard candies, and over 1,000 gumdrops. 3 ft tall LEGO men and women will line the entrance of the gingerbread house, greeting guests each day through the end of December. Santa and his little elf helper will take over the Desert Springs boat dock for photos with Santa and private 20 minute boat rides through Venetian-inspired waterways overlooking the resort’s festive décor. Complimentary refreshments and house made cookies will be served. 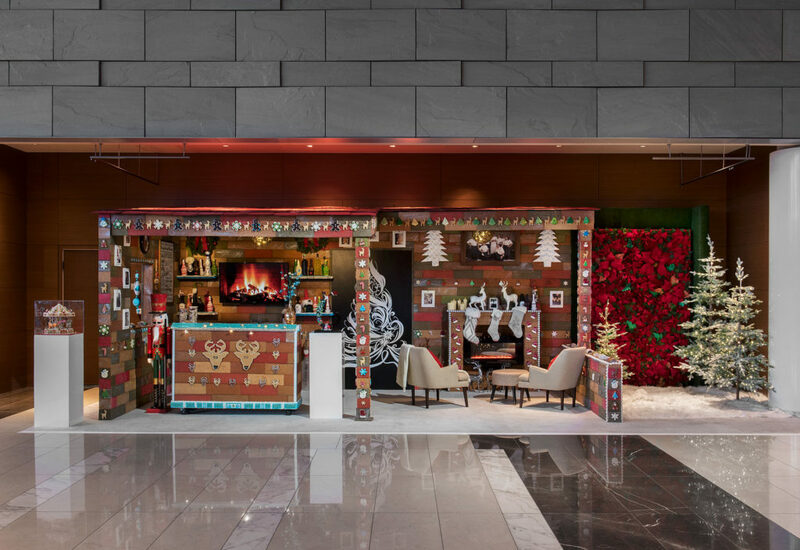 This winter, the downtown Los Angeles hotel JW Marriott Los Angeles L.A. LIVE brings back the first-ever live life-size gingerbread bar – Santa’s Tavern – a modern wooden lodge, comprised of 1,300 lbs. of spiced cookie dough and sugar. Elaborately-decorated bar tools and spirit bottles coated with candy and cookie dough line the inside of the edible watering hole. Each afternoon beginning at 4:00 p.m. Santa’s Tavern serves a festive rotation of holiday refreshments such as the Naughty or Spice cinnamon and chai martini. 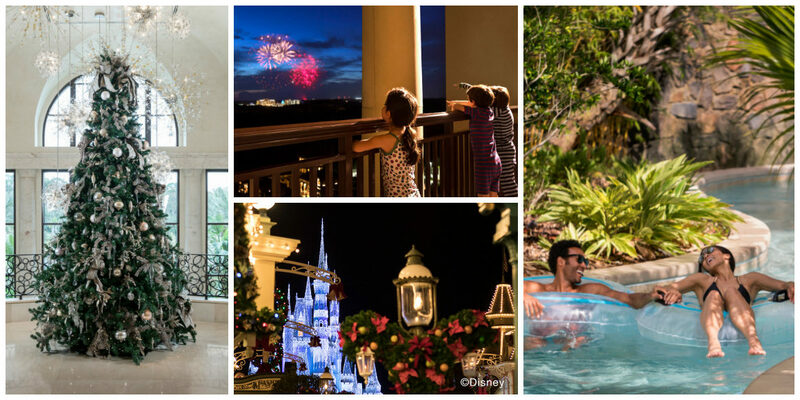 Pin these Luxury Family Resorts for the Holidays for later! We’ll definitely have to visit some of the resorts on this list. The JW Marriott Hill Country Resort, Moody Gardens Hotel, and the Gaylord Texan are also great resorts to visit during the holidays. Thanks!